Mark J. Gasiorowski is a political science professor at Louisiana State University who recently visited Iran. He posted his views on the student protests in Iran on the Gulf 2000 alias. Also see latest photos from Iran. I don't think President Khatami is in danger of losing his popular support in the foreseeable future. I spent most of June in Iran, and while I did hear a certain amount of discontent expressed about Khatami from people who had voted for him, it was not very significant. The honeymoon is certainly over -- especially with the events of the last few days -- but Khatami remains very popular and there is no other figure capable of leading the reform movement. I think Ayatollah Khamenei certainly cannot sit back and play on the dissatisfaction that has emerged. Even if the student demonstrators are crushed in the next few days, Khamenei and the conservatives now have a major problem on their hands. If they do not make major concessions to the students' demands, the unrest that we have seen in the last few days will almost certainly reemerge, and it may well spread beyond the universities. If so, the conservatives will be forced to rely increasingly on repression, transforming the populist Islamic regime that has existed since the revolution into an Islamic dictatorship. This may work in the short term, but in the long term I believe it is simply not viable. Iran is not China, and the Tienanmen Square approach just will not work there. Economic conditions are rather peripheral to this, in my view. University students in Iran (especially those at Tehran University) are not as badly affected by economic conditions as the poorer strata of society, who have not participated in the events of the last few days. Moreover, the slogans raised by the students have focused on political freedom rather than economic conditions. I would add that while oil prices have gone up sharply in recent months this has not yet had a positive effect on living conditions in Iran. Inflation remains problematic, employment prospects for many young Iranians remain grim, and the dollar continues to soar. Though active unrest has spread from Tehran University to universities in many other cities, I have not seen much evidence that it has spread beyond the universities, either to the middle class or to the urban lower class. I think active unrest could well spread to the middle class and to much of the urban lower class if campus unrest persists in the coming days or if it reemerges in the coming weeks or months, with the 70% of Iranians who voted for Khatami in 1997 siding with the students. If this occurs, the conservatives will have a grave crisis on their hands. I have seen no evidence of disloyalty among the security forces. After Khatami's 1997 election, many people in Iran said that districts with large concentrations of military personnel and even revolutionary guards had voted strongly for Khatami, suggesting that the security forces are not strongly supportive of the conservatives and might therefore disobey orders if a major factional confrontation were to emerge. This has not happened so far, and, in fact, there seems to have been considerable cooperation between the security forces and Ansar-e Hezbollah. These trends should certainly please the conservatives and worry the reformists. Looming just over the horizon are the February 2000 parliamentary elections, where the stakes will be much higher than those involved in the present crisis. It's a safe bet that the students, having tasted blood in these last few days, will be watching the run-up to those elections very closely and preparing to return to the streets if they are manipulated. They are likely to respond in a more-organized fashion next time (the current unrest seems very spntaneous), and they may well be joined by many non-students. How the two factions navigate these elections will certainly have a crucial impact on Iran's future. 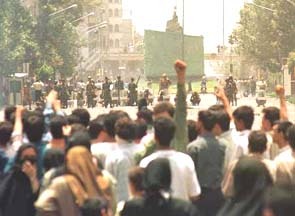 There are three basic directions Iran can go from here: (1) an Iranian Velvet Revolution, with the reformists prevailing; (2) a Tienanmen Square-style crackdown and victory (in the short term) by the conseratives; and (3) a continuation of the gradual liberalization that has been occurring for the past 10 years. The danger in the current situation is that the conservatives will choose option (2) because they think option (1) is otherwise inevitable. Given the balance of forces prevailing in Iran, I think option (3) is the best for all sides. President Khatami's recent statements calling for an end to the unrest suggest that he shares this view. Whether he and other reformists can persuade the students of the danger of option (2) occurring and the importance of accepting option (3) is now the crucial issue, in my view. I would not even hazard a guess at this point about whether this will occur.